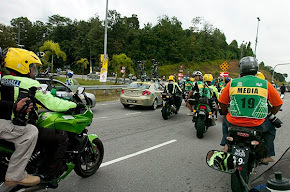 22 APRIL 2012, KOTA KINABALU - CYCLING Fans in the state will now have more reasons to be excited while awaiting the start of Tour of Borneo 2012, from 27 April to 1 May, when five young and talented riders will be flying the Sabah flag in the inaugural tour. 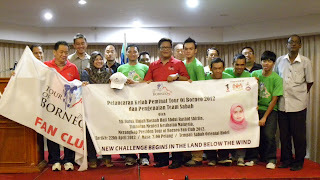 To further support the young team who are being coached by Jatin Imam, Tour of Borneo FAN CLUB were also launched by Suriati Yantey Adam who attended on behalf of YB Datuk Rosnah Abdul Rashid Shirlin, the Member of Parliament for Papar who is also Deputy Health Minister Malaysia, at a press conference held today at Sabah Oriental Hotel in Kota Kinabalu. At the ceremony, Suriati also handed over the Sabah State flag to the team manager, Julian Ong. The Sabah team roster for TOB, under the guidance of coach Jatim Imam, will be headed by national mountain bike champion, Shahrin Amir, Mohd Suhaizan Rayim, Chai Eng Hoe, Jeoffrey Jerry Jemie and Yusuf Ali. 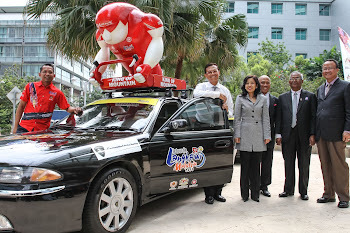 Also present at the ceremony was Tour of Borneo Organising Chairman, Dato’ Fredie Sua and race officials. 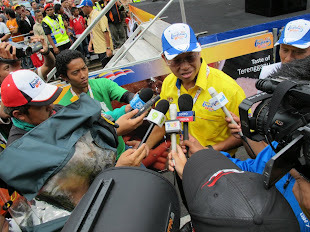 In the press conference, Suriati expressed that YB Datuk Rosnah hopes Sabah team will stand out and bring honor to the state in the inaugural race, it will indeed spark interest in cycling and to influence other young riders. “As a cycling tour that crosses most main districts in Sabah, I hope that more fans will come out to support and cheer our young team on, this will surely boost their determination when competing with the other teams. "The successful organization of the first ever Tour of Borneo will certainly be much sweeter and meaningful when our team can give a stiff challenge to our overseas competitors, and at the same time we hope they will gain valuable experience to become professional athletes in the near future,"she said. 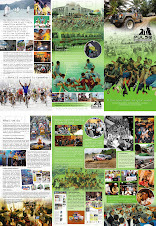 According to Suriati, the federal government and state government always support and encourage the youths to engage in beneficial activities, especially sports and recreation to promote and practice a healthy lifestyle. 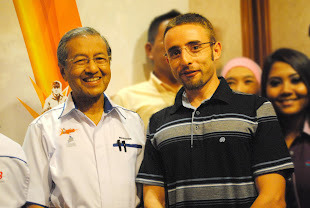 Dato’ Fredie also encouraged cycling fans to be a part of the action by joining the Tour of Borneo Fan Club page on Facebook. 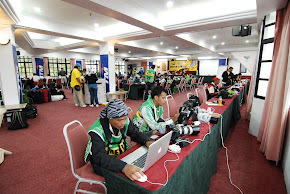 “Our fans will get the latest news about the race, see photos, even post their own photos to the page and also give their opinions for further betterment of the event. We are still learning as we go and it is important to get feedback from the public and especially from our fans so we can improve.” “Cycling fans can log in to our official website www.tourofborneo.com and click on the Facebook link to our Fan Club page, I am excited to see the responses and hope all of our Sabah fans will join in the action.” He added. 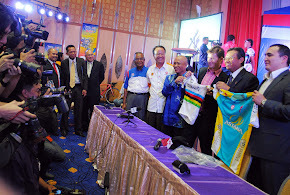 The 2.2 category Tour is sanctioned by the International Cycling Union (UCI) and is listed in UCI Asian Tour calendar, it is hoped to promote Sabah as the ultimate sports tourism destination in Malaysia, and promote cycling in the state. Tour of Borneo covers a total distance of 758.4 kilometer, will start from Semporna and will pass through pictureque locations of Tawau, Lahad Datu, Sandakan, Sepilok, Kundasang and ends in Kota Kinabalu. 20 professional teams consisting of continental, national and club teams have confirmed their participation and will be accompanied by over 520 race officials. 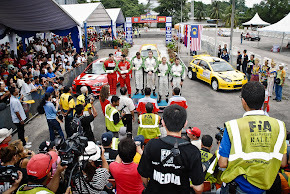 In addition to a challenging route, Tour of Borneo will also held at a time of various festivals held in Sabah such as Regatta Lepa Lepa, Sabah Fest, Borneo International Marathon and Kadazan Harvest Festival celebrations which kicks off on 1st May, providing an opportunity for fans from within and outside the country to experience the joy of a holiday in the state. 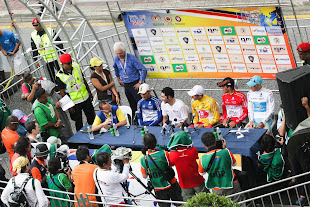 Tour of Borneo will be monitored by UCI President Commissaire from New Zealand, Zac Prendergast. 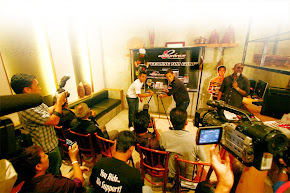 The organizer’s main objective is to promote interest in cycling among the younger generations in Sabah, and expose Malaysian riders to more international level competition, thus contributing to the development of cycling in Malaysia.